FISHING: well shipmates, it seems to be unanimous, this has been the wettest “low” season anyone can remember and mid-month we had a “Super Moon”, the closest the moon has come to Earth in 70 years. While a full moon is often good for trolling, the early part of the month was very disappointing as regard to catches. While divers reported lots of fish about, we fishermen, apart from a few nice Sailfish, found pelagic fish few and far between, and my personal theory was that the fresh water from all the rain we have been having was lying on the surface of the sea forcing the pelagic predators into the depths, as very few fish species can handle too much fresh water. 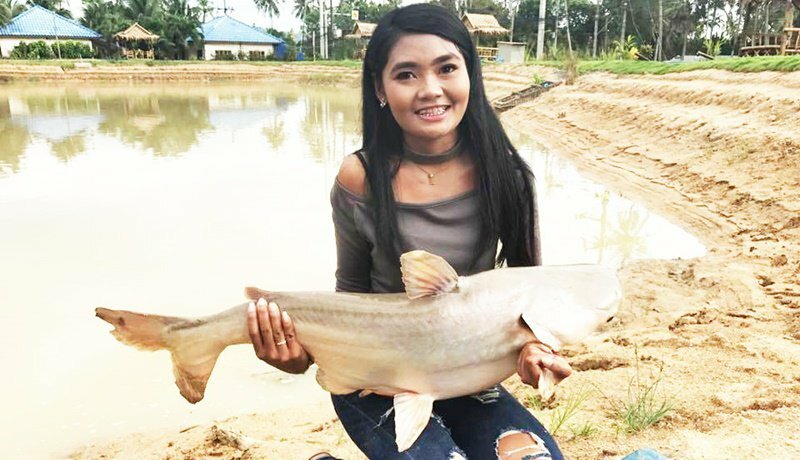 November also saw the grand opening of the Chalong Fishing Park, which, while not being as “exotic” as some of the parks on the mainland, does have the big advantages of convenience and much more realistic prices for those of us who like to have rod in hand on a regular basis. The lake is surrounded by about a dozen salas and the infrastructure includes an office, bar and swimming pool which makes the place very child friendly, I especially liked the “rope swing” chairs and hammocks which added to the chill-out atmosphere of the place. The groundwork, as regard plants, trees etc. will take some time to get established, but it should not be too long before the remainder of the construction work is grassed over, which would be my only criticism of what will obviously become a first-class venue worthy of recommendation. While I was there, along with quite a few well-known local “worm wigglers” I was lucky enough to snap one of them landing a Mekong Cat which I estimated to be around 25 kilograms, a nice fish in anybody’s language. And finally, November was the time for the annual P.I.S.T. 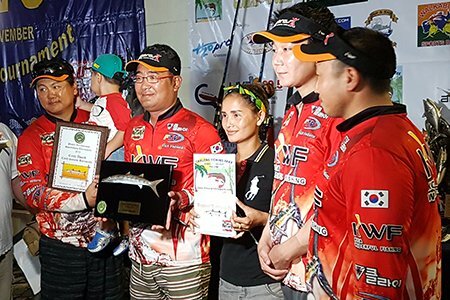 Competition (Phuket International Sports-fishing Tournament) and not surprisingly, after taking the wind out of the opposition’s sails with a staggering nine Sailfish tally on the first day, “Fish Eagle”– Capt Andrew – and the “Fighting Irish” team went on to dominate the proceedings. From reports it looks like the fishing was extremely frustrating, with Sailfish jumping everywhere and not biting, while the Wahoo and/or King Macs were regularly accused of slicing through steel trace. So it’s well done the boys from Cork. The Russian team “Ardent Anglers” came in with a good overall 2nd place score, and our pals on “Thai 2 On” get a day ticket, for the whole team, to fish the “new” Chalong Fishing Park “as mentioned above” for landing the largest Wahoo, having caught the only two of the competition, a nice sponsorship gesture from “Jez” Wilson the owner/manager of the park. So me hearties, that’s it for another month, tight lines to all.